New Delhi, Feb 14: Today Feb 14, AICC national president Rahul Gandhi was in Valsad, Gujarat to stage a rally. 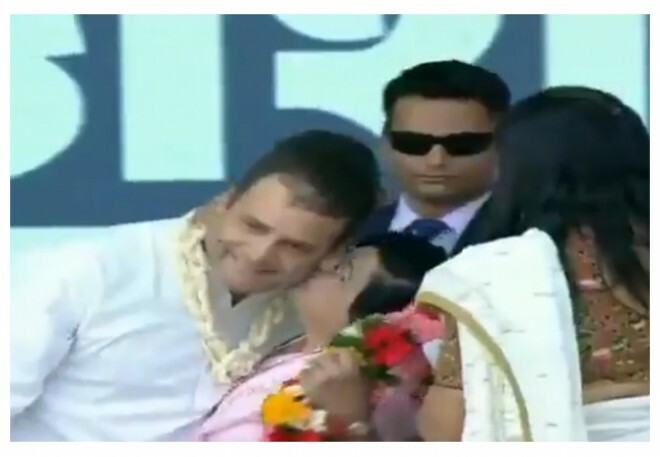 On the occasion of Valentine's Day, Rahul Gandhi received flowers from his female supporters apart from receiving unexpected kisses from an elderly female fan as well.The Video of this incident goes Viral on the internet. A shocked Rahul Gandhi looked embarrassed and the entire scenario caught on camera. The lady who appeared to be in her 60's who smothered Rahul Gandhi with kisses was allegedly a senior Congress worker. The lady who Rahul Gandhi told the media "I am a senior party worker from Surat. I am also a Parsi. I am in the Congress for over 48 years now. I am Rahul Gandhi's well-wisher. He is like my brother," she said.